Wow, things are really moving along quickly! Week 7 was a busy and productive one, so there are many things to show you. 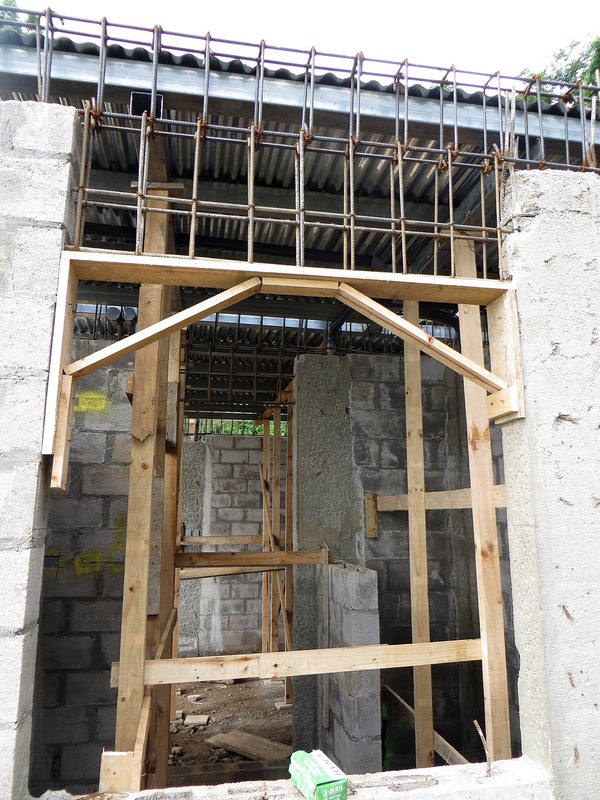 The last of the concrete columns within the first floor walls was completed and the remaining re-bar of the crown beam was put into place. 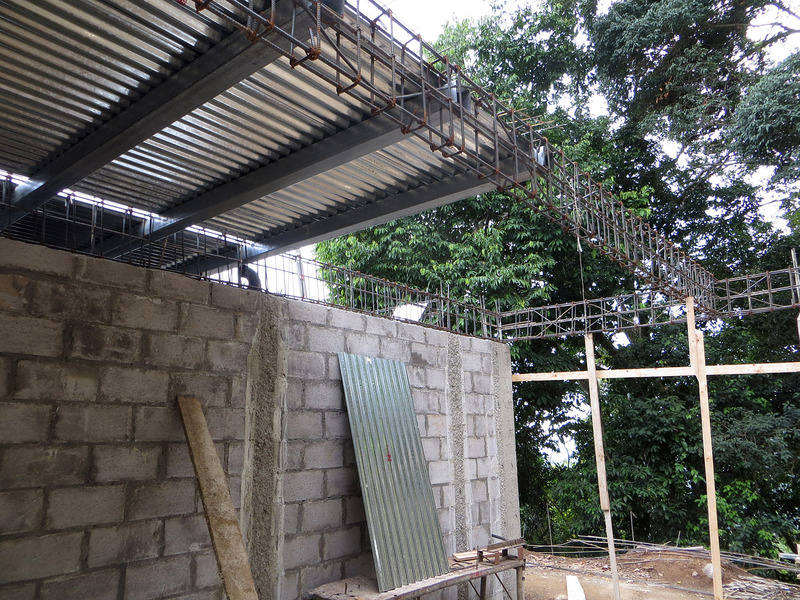 Then work started on installing the steel beams that support the concrete floor of the second level. 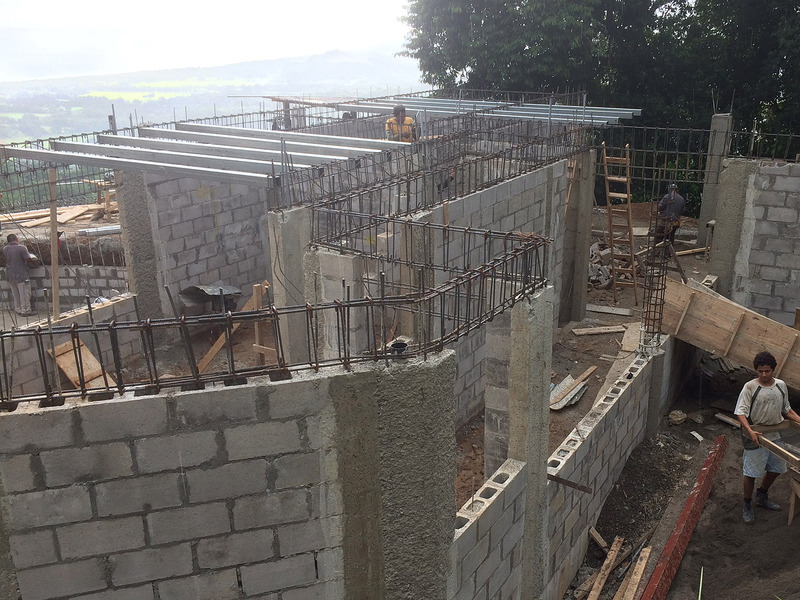 Steel beams being installed for support of the second floor. 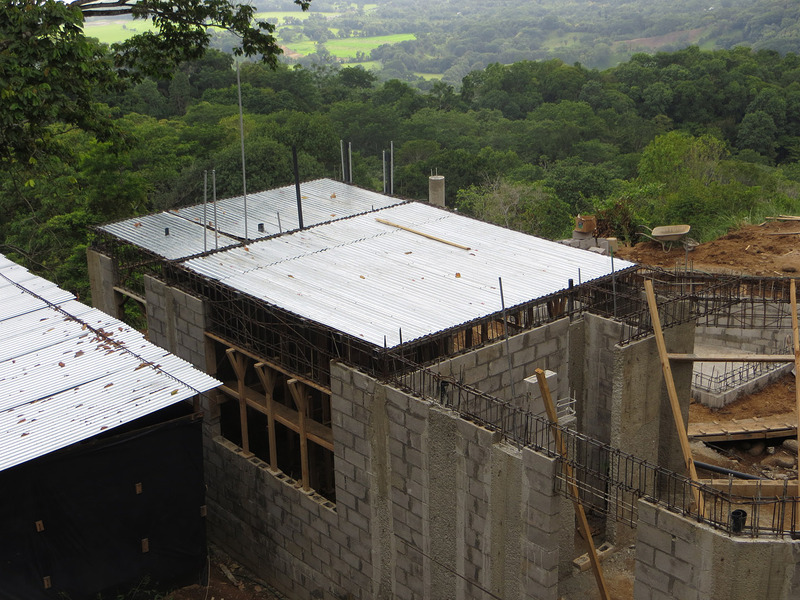 On top of the steel beams, a zinc sheeting is put down upon which the concrete floor will be poured. 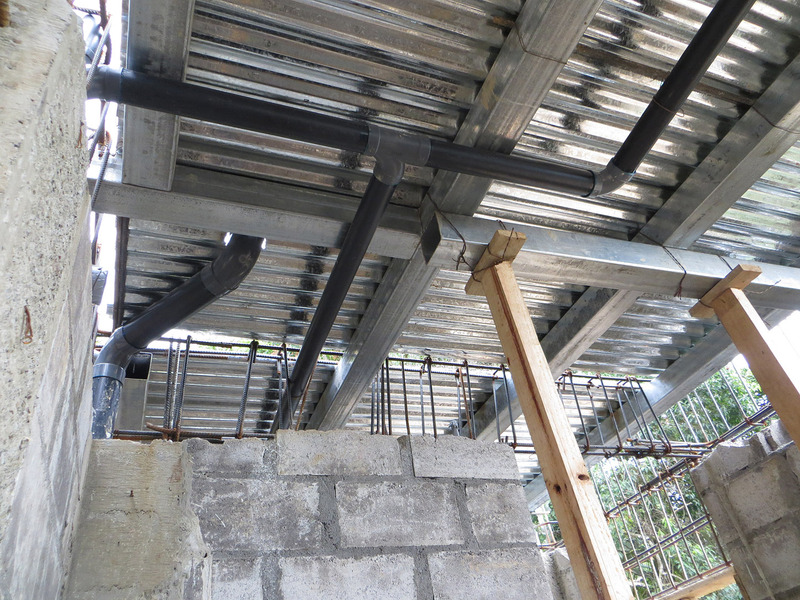 Before pouring the concrete for the crown beams and the second floor, the plumbing and electrical conduit is run up through the floor as shown in the photograph above and below. A view under the deck of the second floor guest suite bathroom of the plumbing lines. Marvin Montoya and his team of guys are doing a great job. Everyone seems to enjoy what they are doing – always having fun, joking around or singing. 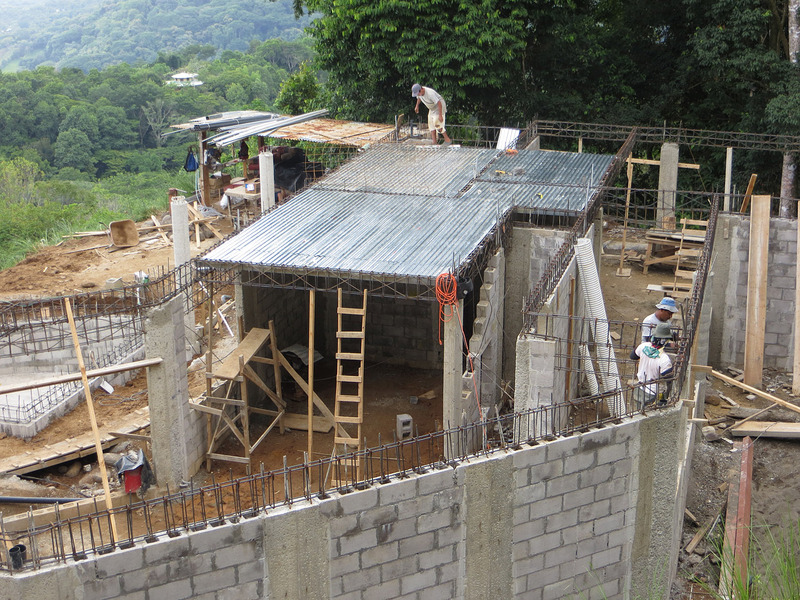 They know how to build a quality home and are really working hard to make it happen. Costa Rican men are generally not the biggest guys, but they sure are strong. For instance, the other day when the delivery truck came with a load of materials, including 70 110-pound sacks of cement, they unloaded it like it was nothing. 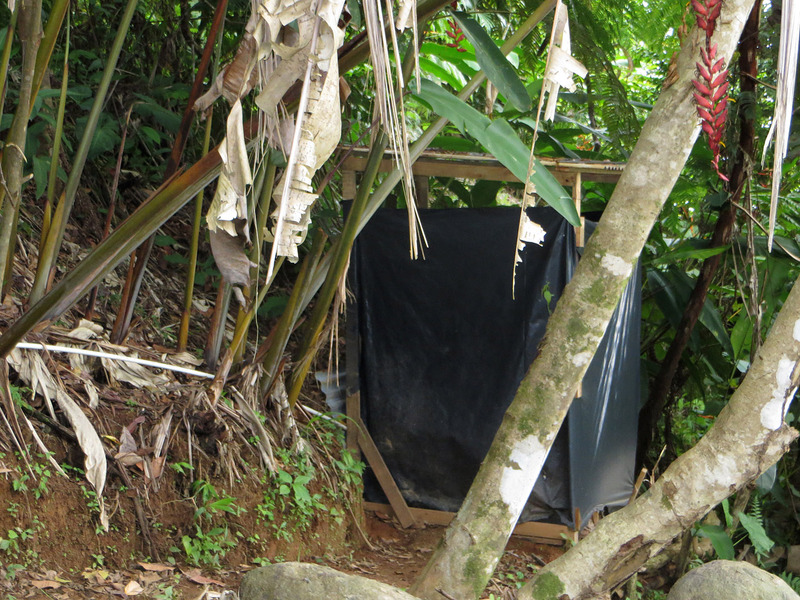 During the week, some of the crew lives on site – in very modest accommodations. 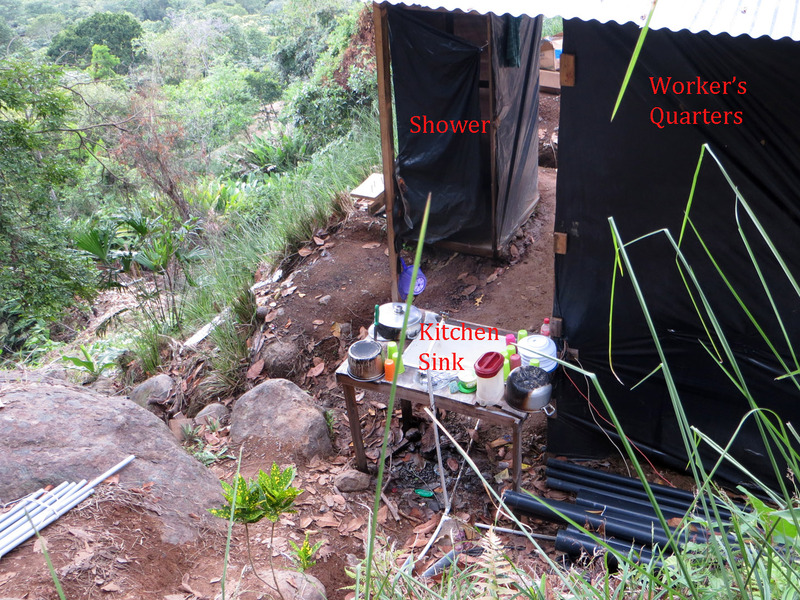 They have a small “house” with some bunk-beds built in and a small kitchen with a sink, gas cook top and a refrigerator. Outside there is a shower and an outhouse. 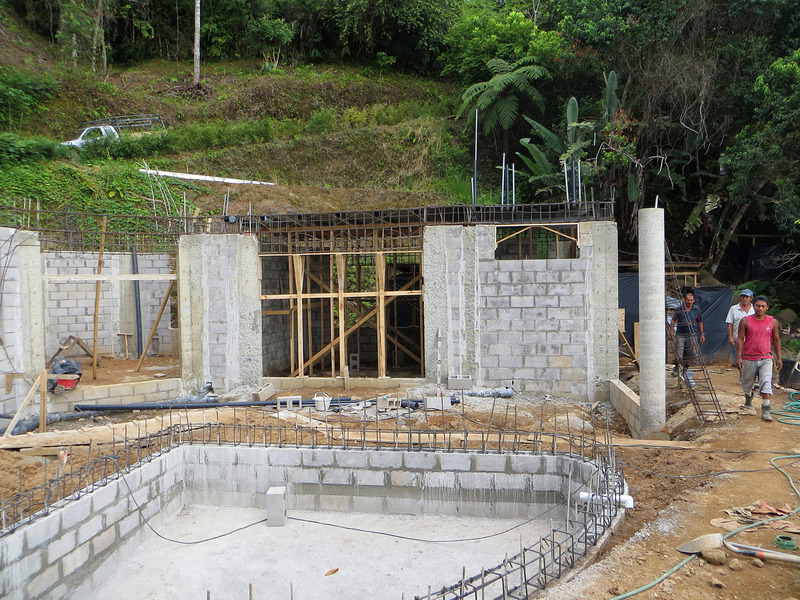 Much progress has also been made on one of my favorite things… the pool! 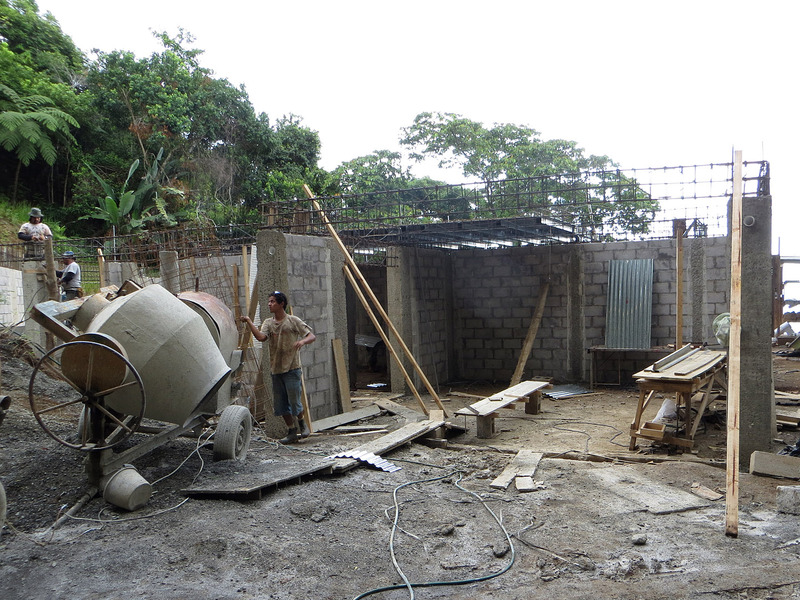 The concrete floor was poured and the walls started. Of course one needs a sheltered place that is out of the way to locate the pool equipment, mainly the pump and filter. 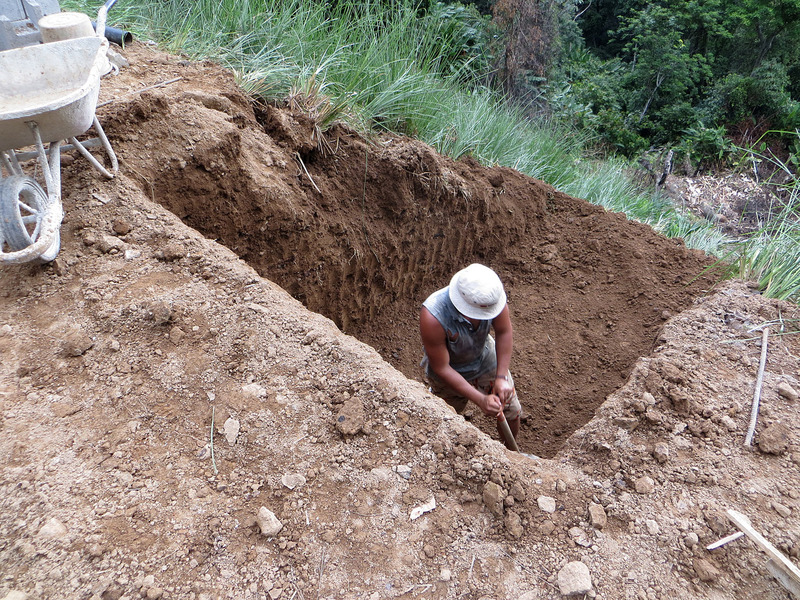 We decided to put it at the front of the plantel (building site) dug down into the earth, so it will be hidden. 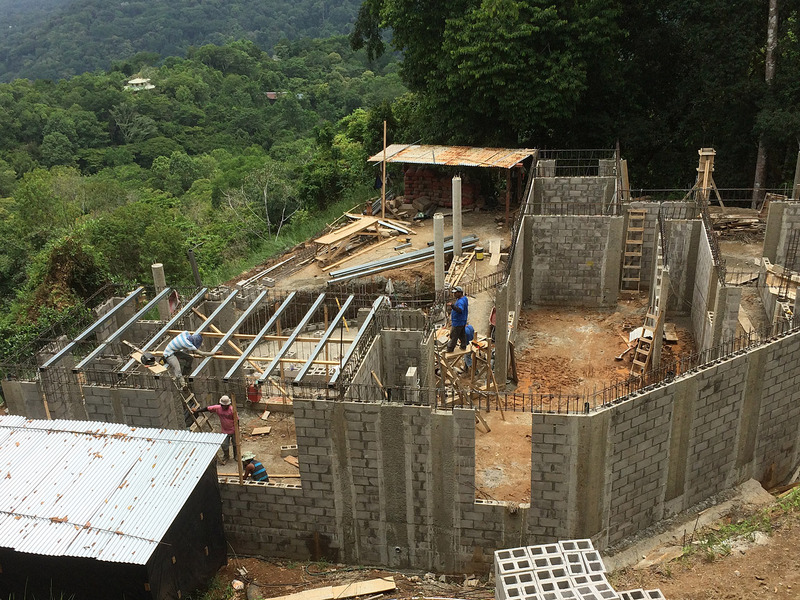 The pool equipment room is being dug here at the front edge of the plantel. We have also started to look at some finishes, such as floor tile. There are a massive number to choose from, but we managed to find one that we really like for use in the majority of the house. 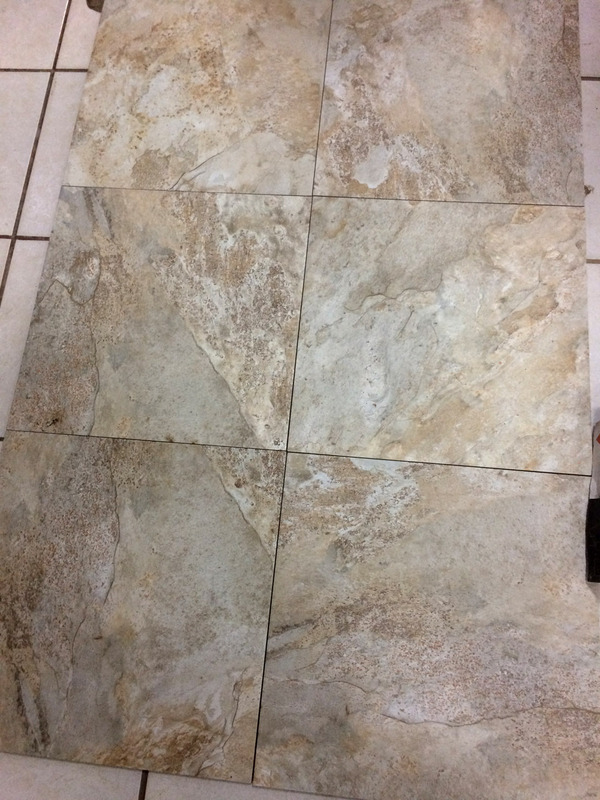 It’s a porcelain tile with a nice natural stone pattern and texture, so it will not be slippery or show the dirt much. For the bathrooms, we plan to select something different. This is the primary floor tile we are using through most of the house. 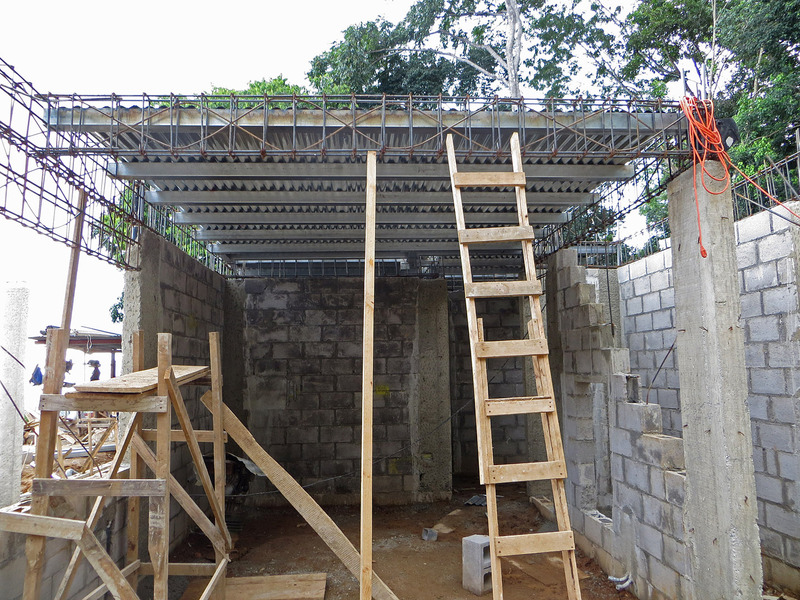 In the carport, above is the floor structure of the guest bathroom on the second floor. 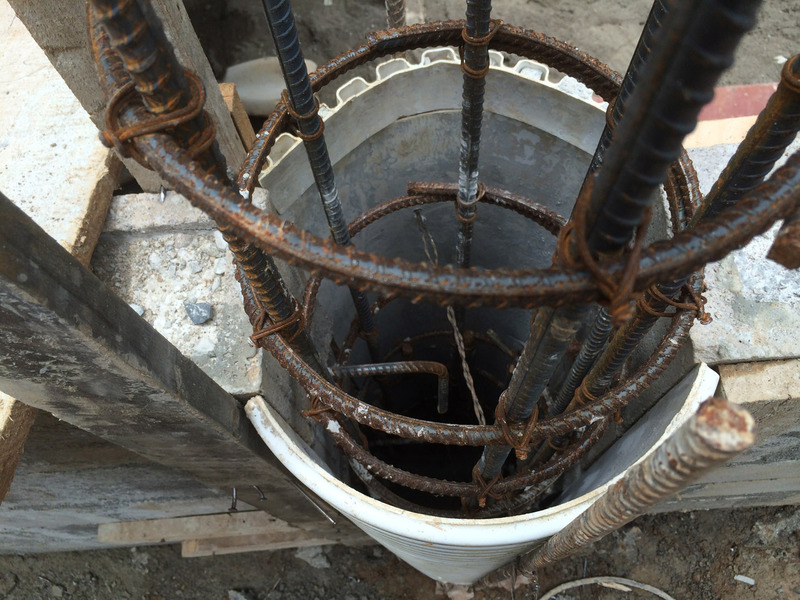 Construction of a circular column…looking down at the re-bar reinforcement inside the white plastic form. 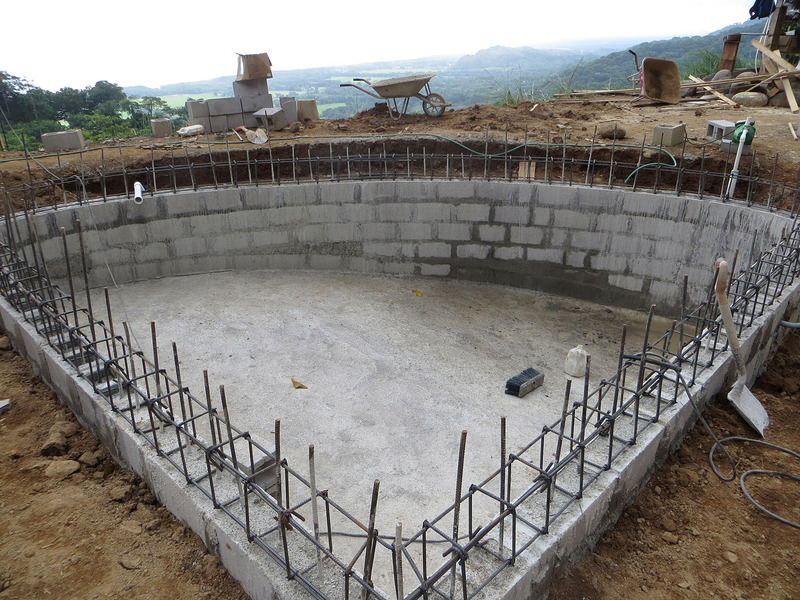 Ready for concrete. 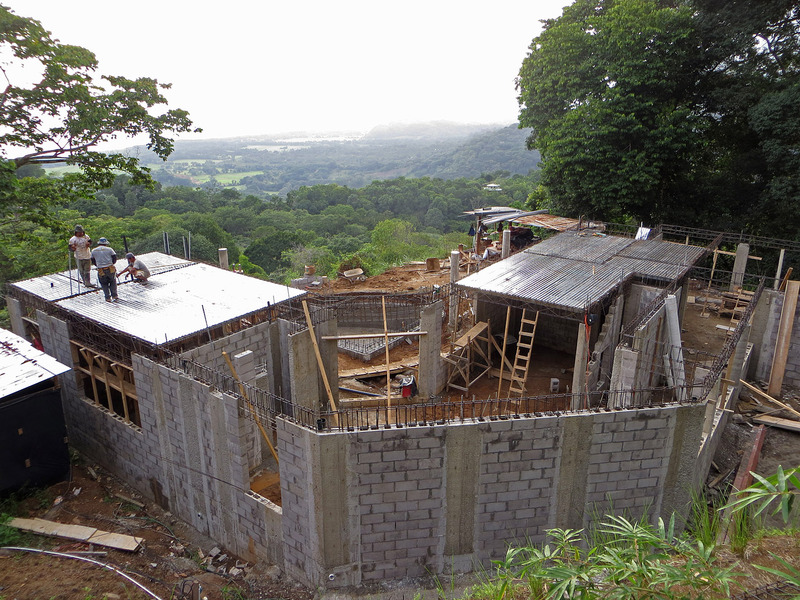 View of the house at the end of week 7. 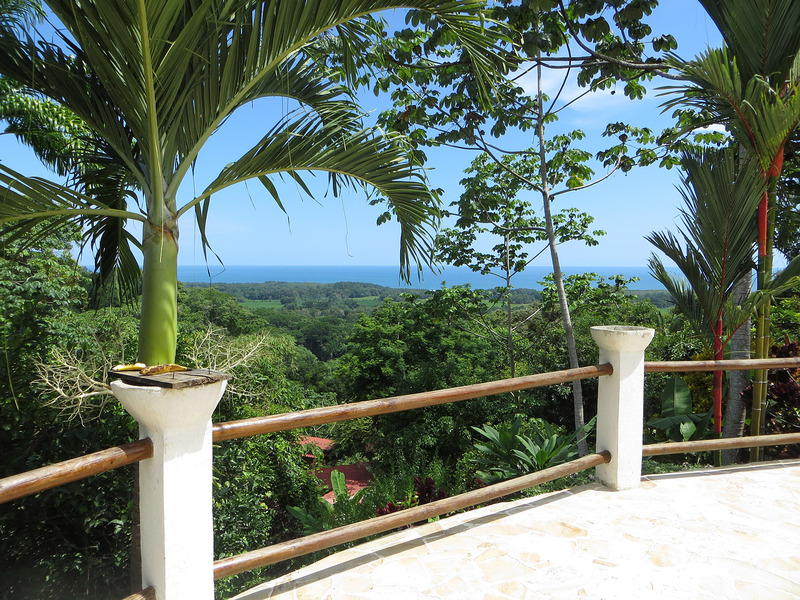 On this beautiful day as I sit at the computer putting this blog post together, this is the view I have to look at out my window….not bad, huh!!! 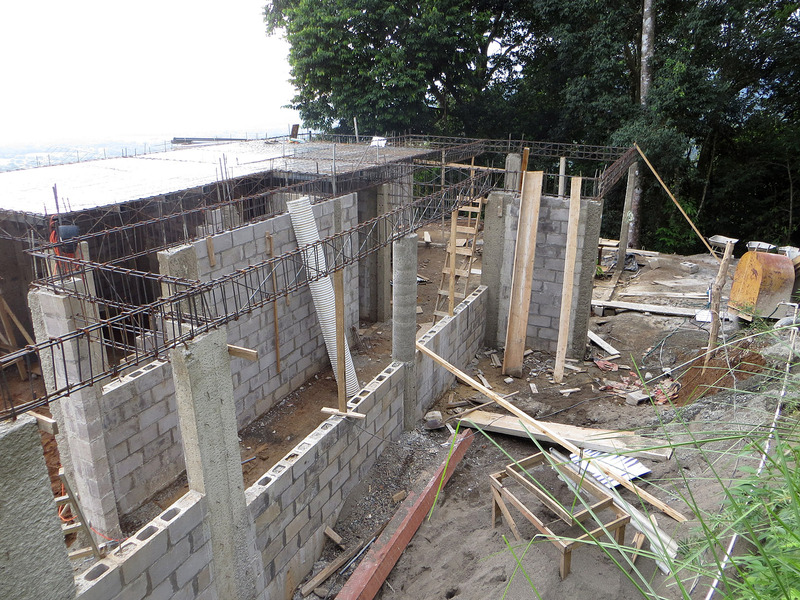 This entry was posted in Building our House and tagged building a house, Costa Rica, house construction. Bookmark the permalink.